Are you looking for affordable tours in New Orleans that will blow your socks off? Perhaps you’re looking for something that is outside the ordinary? We get it. We see a lot of customers who are interested in something outside of Bourbon Street and the French Quarter in New Orleans (Which, of course, you should check out! They’re popular for a reason!). Marie Laveau is one of New Orleans’ most famous practitioners of voodoo. Considered by some the “Voodoo Queen”, her tomb is still accessible through tours. It’s a favorite spot for many tourists who want to experience New Orleans’ history. We’re proud to be the leading company for airboat tours! If you want a New Orleans swamp tour. This is an exciting adventure that we’re proud to be able to offer at affordable prices. There is a reason our reviews are so incredibly positive, we provide a family-friendly environment that is still adventurous. This is a steamboat situated on the mighty Mississippi River. They offer a dinner cruise, a scenic view of the river, and a good time. It’s one of the great experiences that someone can have in New Orleans, whether they are a local or a tourist. There are a number of cocktail walking tours in New Orleans, which some claim is the birthplace of the cocktail. This city, so well known for alcohol, has so many local, recognizable cocktails that are worth trying, including the Sazerac, the Hurricane, and the Gin Fizz. See them all on a tour! Hurricane Katrina swept through New Orleans and left, in its wake, nothing but heartbreak and devastation. The story hardly ends there, though. The true story of Katrina is one of recovery and resilience. There are a number of tours that can take you through the disaster and also the recovery. We highly recommend this to anyone interested in the history of New Orleans and how the hurricane affected our great city. New Orleans is home to numerous breweries. Brieux Carre Brewing Company, Crescent City Brewhouse, Urban South Brewery, Second Line Brewing, Port Orleans Brewing, and many others. They each have their own wonderful flavors and funky atmospheres. So, if a brewery is your kind of tour, take a trip! New Orleans is known for its many hauntings. From slave quarters and voodoo to vampires and serial killers, New Orleans has it all. If you’re into spooky, creepy, scary, and crawly, then New Orleans has all the haunted tours you could ever hope to see. It’s a city known for its scares. If you’re looking at tours in New Orleans and you’re interested in seeing the swamps of Louisiana, we’re excited to host you! Come let us show you how beautiful our swamps can be from the back of an insanely fun airboat! Well, there are several things that set us apart. One of the things that our customers like best about Airboat Adventures is our dedication to a good time. To ensure all of our customers are satisfied with their tour, we aim to provide the very best tour guides, exciting routes, different tour package options and an indoor facility with gifts and snacks. Oh, and did we mention that we also have the only albino alligator in South Louisiana? That’s right, her name is Sugar and she is most certainly sugar and spice and everything nice. We are aficionados of all things Louisiana, and love showing our passion to everyone who walks through our doors. So get your cameras ready, because there will be so much to see on your airboat ride with Airboat Adventures. And so much more! While we are mostly known for our alligators that get as large as seventeen feet, we have more to offer as well. There are so many sights to see, and so much fun to be had with Airboat Adventures. Small Party, Large Party, We Accommodate! Whether you bring your whole crew or are keeping it small and intimate, we offer two airboat options to accommodate your party size. Our small airboat can fit 6-8 passengers and is perfect for that date night you have been putting off. The cost for this airboat ride is $75 per person. If you are looking for a boat that can accommodate your birthday party, bachelor party or whatever big group outing you may have, our large airboat can accommodate up to 30 people. The cost for this airboat ride is $55 per person. 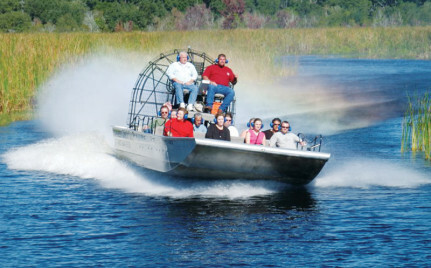 Both airboats offer round-trip transportation for $20 extra per person. If you are ready to start your airboat ride, book online here. If you want to learn more about our swamp tours, visit our Swamp Tours page for more details. We are excited to take you on the airboat ride of a lifetime as we witness the natural beauty that Louisiana has to offer. If you have questions about what to expect on an Airboat Adventures tour, our FAQs page is a great resource. If you would like to speak with someone directly, feel free to call 504-689-2005 or contact us today! Take An Airboat Tour in New Orleans! The promise of warmer weather, beautiful foliage and crawfish season are enough to make us excited for spring. The alligators that inhabit our 20,000 acres of Louisiana cypress swamp would agree as well. When you come on an Airboat Adventures tour in New Orleans you can see alligators up to 17 ft. sunbathing under the warm sun. Spring is a perfect time to come experience the creatures of the swamp on a one-of-a-kind airboat tour in New Orleans! 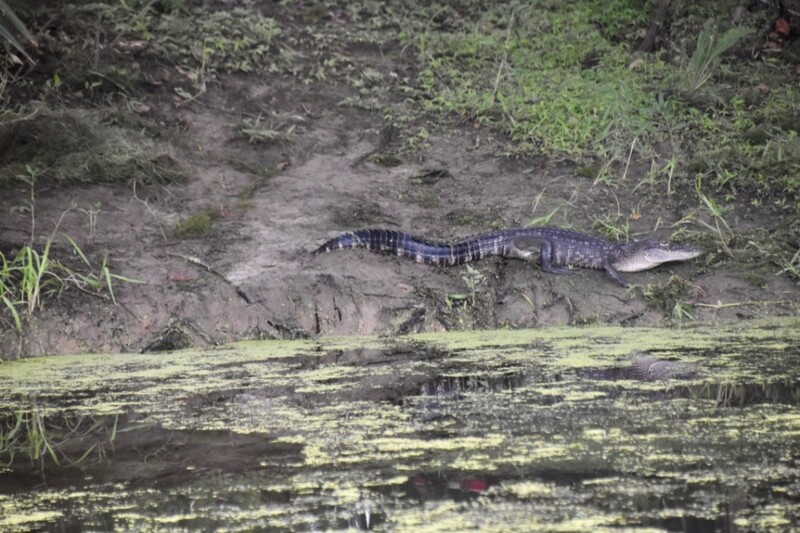 Did you know that on an Airboat Adventures tour, you not only see alligators of all sizes, but you also get to witness some of the most magnificent fauna and flora in Louisiana? That’s right. During the hour and forty-five minutes that you’ll be out on the open waters, you will experience alligators, turtles, egrets, herons, ibis, hawks, owls, bald eagles, raccoons, and more! When we say that you’ll see creatures of all shapes, sizes, and colors, we truly mean it. 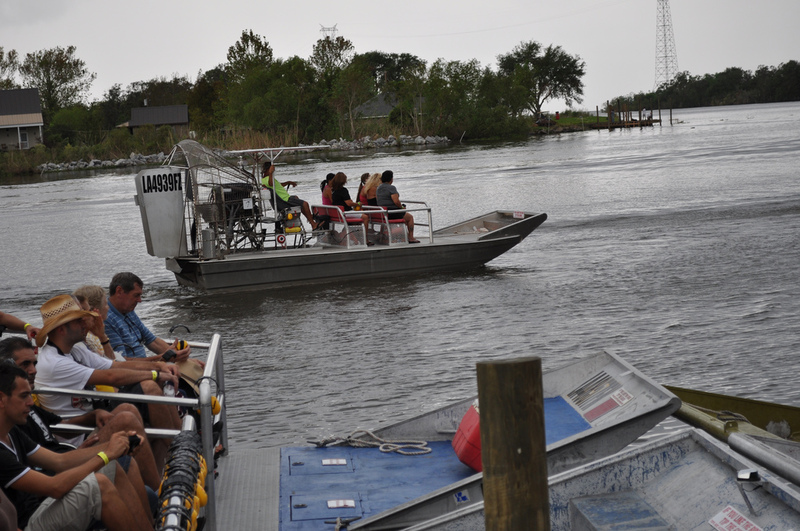 Airboat Adventures currently offers two tour packages. We offer a small airboat that can fit 6-8 passengers and is $75 per person, and a large airboat that fits 15-30 people and is $55 per person. Both packages offer round trip transportation from any hotel in the Greater New Orleans area for an additional $20 per person. Visit our swamp tours page to find out more information about tour times, hours of operation and more! We are dedicated to providing an unforgettable experience for people of all ages. If you are interested in learning more, feel free to contact us or visit our FAQs page. 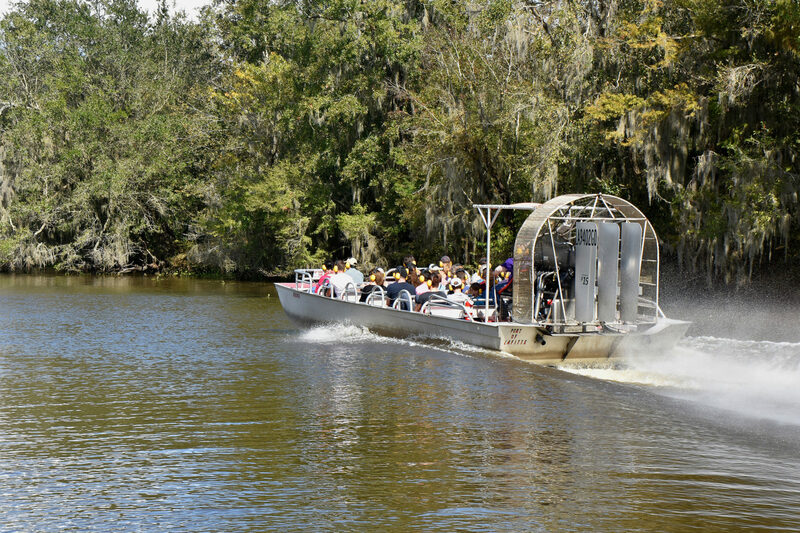 Don’t miss out on the adventure of a lifetime with an Airboat Adventures tour in New Orleans. We are always eager to answer any questions you may have. Call us at 504-689-2005 or book online today! The best way to learn about the Louisiana swamp is to experience it for yourself! The best way to experience the swamp is on an airboat that glides over the bayou and gets you up close and personal with Louisiana wildlife. A Louisiana swamp tour will help you to get that up-close perspective. Here are 10 things you didn’t know about Louisiana swamps to hold you over until then. Louisiana is home to three million acres of wetlands. Fishermen catch more shrimp in Louisiana than any other U.S. state. Alligators have existed for nearly 200 million years, and over two million wild alligators live in bayous across Louisiana. Louisiana’s cypress trees were used to construct Higgins boats in WWII. Louisiana land is washing away, due to erosion caused by the building of levees, drilling for oil and dredging canals, at the rate of a football field every hour. Louisiana has the longest coastline of any U.S. state because of bays and sounds. A swamp is an area that hold water and supports woody vegetation, while a marsh is an area that hold water but supports only non-woody, soft, green vegetation. The nutria was imported from South America in the 1930’s for fur farming. Swamps exist across every continent except Antarctica. Swamps are a worldwide phenomenon and you can see incredible swamp-lands in a number of states in the U.S. However, Louisiana swamps are worth seeing. They offer a unique environment that can be seen no where else. Living and visiting South Louisiana has a tremendous amount of perks. The weather is warm, the people are friendly, and the culture is fun and enjoyable. Furthermore, the nature and wildlife in Louisiana is among the best in the country. However, inside the heart of the cities it can be difficult to experience the wonderful flora and fauna that is so close. 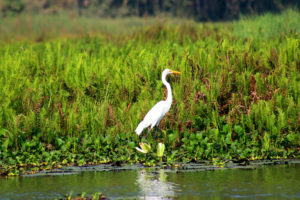 For those that wish to enjoy the nature that Louisiana has to offer, taking a swamp tour is a perfect option! A swamp tour with Airboat Adventures is an all encompassing and fun opportunity for an animal lovers from all over. When Should I Go On My Swamp Tour? 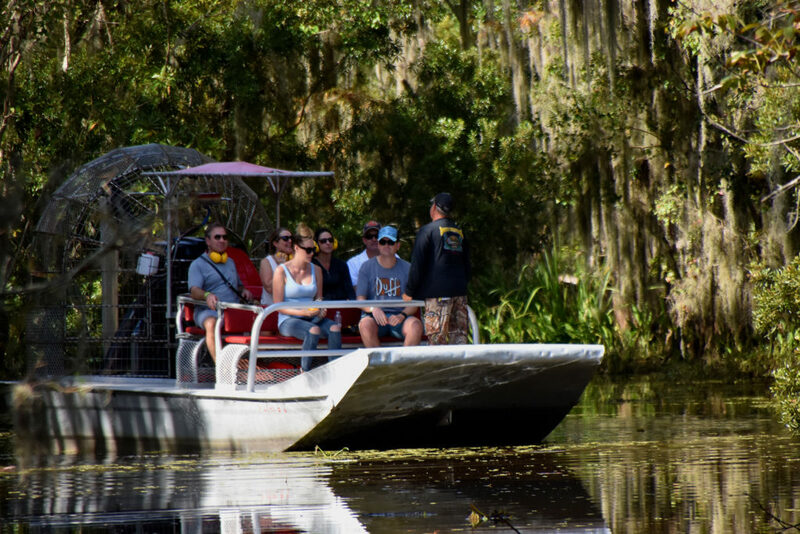 One of the most attractive aspects of taking a swamp tour with Airboat Adventures is that there is never a bad time to take a tour. Some may be concerned that they won’t see much in the winter, but that’s entirely untrue. The shift of seasons is actually fantastic because tourists can see a new group of animals. With this in mind, adventuring with Airboat Adventures more than once is not uncommon because groups love the varied experience. Although all times are great for an Airboat Adventures tour, the most popular times are April, late October, and early November. One aspect that makes winter different than summer is that the grass that is around 6 feet tall in the summer is only a few inches during the winter. This allows for greater visibility of the surrounding area. When the grass is low, guests see more of the Louisiana famous nutrias and serene deer. Furthermore, migratory birds come in the winter so guests can see birds such as waterfowls and even the elusive bald eagles. Guests looking to see alligators are in luck because gators are visible year round. In the winter time they can be harder to find when the temperatures are particularly cold, but with the warm Louisiana winters the gators still come around. Other beautiful animals the guests can often view on their Airboat Adventures tour include; snakes, turtles, egrets, herons, ibis, raccoons, and more! One of the best aspects of Airboat Adventure’s swamp tours is the readily available knowledge that can be shared by the amiable tour guides. The Airboat Adventures guides are highly capable to lead these animal lover tours because each of them has grown up in the area. Growing up in South Louisiana, all of the guides are expert fisherman and know the waterways better than anyone. In addition to their personal experience with the area, each guide has practical experience in that they are all expert airboat captains that are certified by the U.S. Coast Guard. How are the Tours Organized? Swamp tours are offered in different packages so guests can have their pick of what kind of experience that they have. Each tour lasts about 1 hour 45 minutes to 2 hours. Groups come in different sizes, so there are two sizes of boats offered. If groups are wishing for a longer experience or they really wish to see the sunset, groups can opt to pay an additional fee. Tours depart at several times throughout the day including ; 9AM, 12PM, 2PM, and seasonally 4PM and 6PM tours are offered as well. Groups that are excited about their tours and ready to start their adventure may book online. 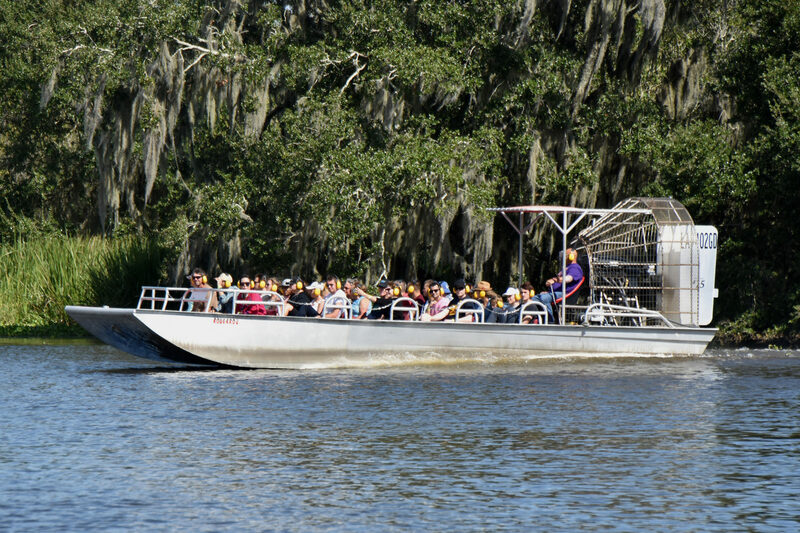 Airboat Adventures wants Louisiana residents to come on the tours, but we also want as many tourists as possible to be able to enjoy this one-of-a-kind experience. To help with this, Airboat Adventures offers a convenient hotel pickup service. Anyone staying at a hotel in downtown New Orleans can be picked up. The pickup service can quickly be arranged by calling us. Contact us as soon as possible for the perfect animal lovers tour! Spring is a great season for many reasons: beautiful weather, plenty of sunshine, the animals are active, the flowers are in bloom, and life renews again. Spring is a particularly nice time in Louisiana, where the temperature is warm, pleasant, and not yet in the brutal stages of summer heat. 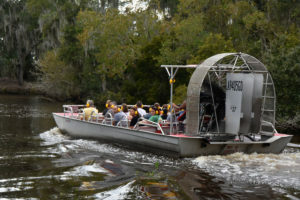 If you are visiting New Orleans this spring and are looking for an exciting outdoor activity to do with your family or friends, be sure to check out the one-of-a-kind airboat tours offered at Airboat Adventures! Airboat Adventures hosts personal swamp tours through some of Louisiana’s most scenic bayous and waterways, propelling you through a watery world untouched by mankind. 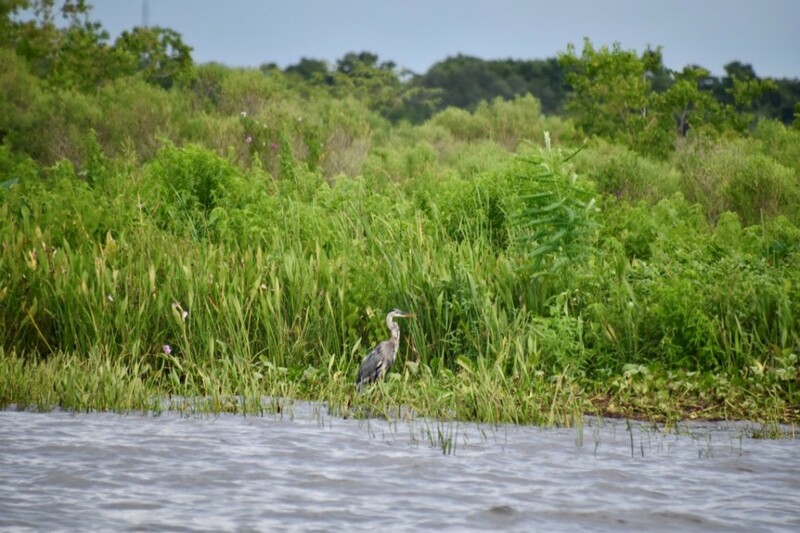 An airboat tour is ideal for those adventure seekers looking to enjoy an exciting day on the water, experiencing Louisiana’s unique plants and wildlife first-hand. What are you waiting for? Come embark on the adventure of a lifetime and book your airboat tour with Airboat Adventures near New Orleans today! When you embark on an airboat tour with Airboat Adventures, you will become completely immersed in a unique world unlike any other. 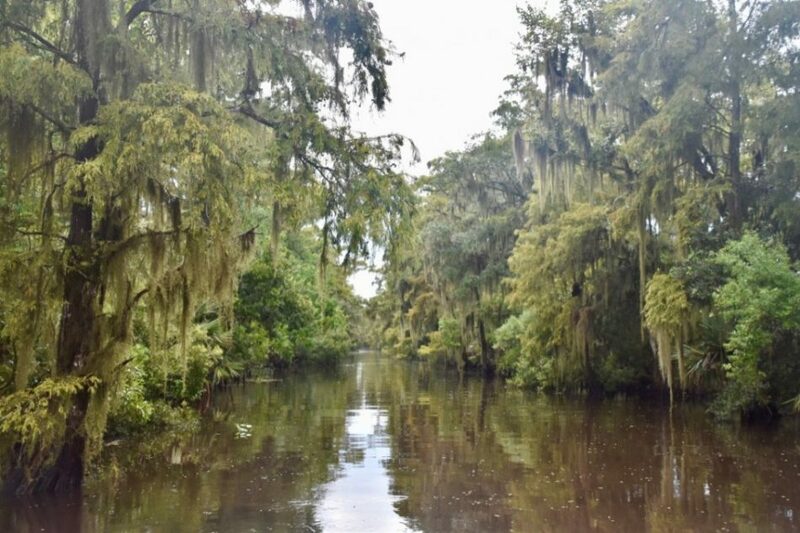 Our fast-paced airboat tours last about an hour and a half to two hours, where you will be gliding through 20,000 acres of tidewater cypress swamps. 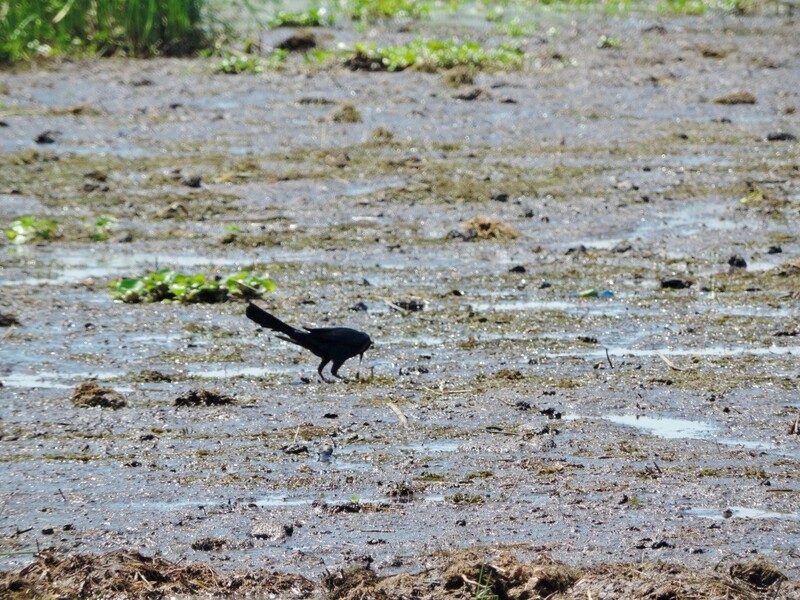 This rich ecosystem is home to various types of wildlife, including multiple types of aquatic and moist-soil vegetation. During the spring time, many of the animals are active due to the temperate weather, increasing your chances of witnessing one of nature’s beautiful creations up-close and personal. While on our exciting spring tour, you will have the opportunity to see snakes, turtles, egrets, ibis, herons, hawks, bald eagles, owls, and even alligators in their natural habitat. Our tours provide a hands-on learning experience for people, which is especially fun for children. Our knowledgeable guides have plenty of experience in the swamps, and will be happy to share interesting facts and information about the region with you during the tour. Airboat Adventures makes planning your airboat tour a breeze. If you are staying at a downtown New Orleans hotel, we will pick you up from your hotel and bring you to our location, making it easier on travelers that may not have a car at their disposal. We are located just thirty minutes from the New Orleans French Quarter, conveniently located close to many famous landmarks and tourist sites. You can plan your swamp tour on whatever day is most convenient for your schedule, since we are open seven days a week! We offer great tour times as well, including a romantic sunset tour for those looking for a romantic evening on the water. Regardless of your age or your interests, everyone will enjoy an exciting airboat tour through southern Louisiana’s dynamic wetlands this spring. Come glide through moss-draped cypress trees and low-hanging tupelo gum trees on one of our airboats, where you will have the chance to see a variety of different critters and crawlers like you’ve never seen them before. Contact Airboat Adventures near New Orleans today to schedule your once-in-a-lifetime adventure this spring!